Volunteer With Columbus brings some of Columbus’ best volunteering opportunities to one place: this is some of the most fun volunteering you’ll ever have! 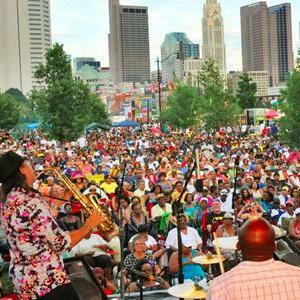 Featuring only leisure volunteering opportunities at festivals and events, Volunteer With Columbus is an easy way for you to experience the events that make Columbus fun! I’ve picked out a few of the volunteering opportunities; check out http://joinuscolumbus.com/volunteer/ to view dozens of others or to register to become a volunteer! Asian Festival – Dragon Boat Marshall: if you haven’t seen the Dragon Boat races yet, you’re missing out. And you can’t watch from a closer place than dockside helping people enter and exit the boats! Columbus Arts Festival - Hands-On Art Assistant: this is a really neat opportunity to work under the direction of some of Columbus’ most talented artistic groups to help children and adults complete art projects on-site. Sail-A-Bration at the Santa Maria – Greeter: welcome people to the awesome fashion show and children’s activities and hand out programs to all of the attendees. Solebrate! 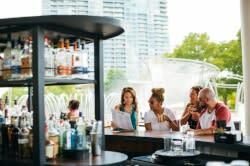 Food & Music Fest – Adult Beverage Server: who hasn’t wanted to be on the other side of the bar? Serve beer and wine redeemed with wristbands. Red, White & Boom – Parade Section Leader: be a part of the parade and get some great exercise at the same time. This is an awesome way to experience the crowds and the performers from the best location! Jazz & Rib Fest – Canoe Activity Aide: help attendees get in and out of canoes, and ensure everyone has a fun time at one of the neatest activities at the Jazz & Rib Fest.